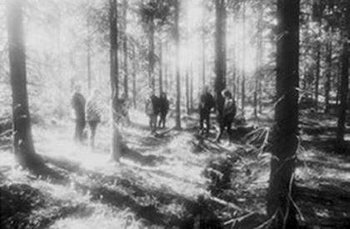 Kristiansand’s In The Woods was formed in 1992 with Tchort (of Emperor fame) as a black metal band and soon issued a demo called Isle of Man. This demo was re-issued by Hammerheart in 1996 as Return To The Isle Of Man. The band issued three albums for the UK-based label Misanthropy. The members were consistently active in other bands and the line-up was intertwined with Green Carnation. The band officially quit in 2000, but not before recording a farewell concert for Prophecy Productions and The End Records. Oddvar died in 2013. Naturally, the band returned in 2014. Bernt Sørensen became the second guitarist in 2018. Norway's In The Woods has certainly come a long way from the days when band members would deny being a black metal band in favour of the pagan metal label. The band quickly took a left turn, went melancholic, psychedelic and everything else one can think of and garnered the instant adulation of the more hip and suave of the metal fans. After years of silence and long after the band's disbandment, In The Woods has released this live album which was originally recorded in Christiansand, Norway on December 29th of 2000. It has taken the release three years to appear, but it is here now and seeks to confirm everything one suspected about the avantgarde music band. The band is indeed introspective and moody. The band's choice of a cover version really says it all. White Rabbit is a classic of the flower power generation. The band's two-disc set spans the band's discography with a surprisingly good sound. More importantly, like the acid rock bands of yore the band dares to jam, stretch and innovate with its songs giving the live album a reason to exist - other than a farewell memento that is. Nevertheless, In The Woods, has no metal left in it. All that is left is a band clamouring to recapture the vibe of Fleetwood Mac or Pink Floyd which, if this writer were to hazard a guess, have not been granted heavy metal status yet. The CD comes free with a third disc featuring the label's assorted roster. - Ali "The Metallian"